Police have formally arrested Umma Sultana Popy alias Shampa, one of the key suspects in the killing of Feni madrasa student Nusrat Jahan Rafi. “Shampa was detained several days ago but she was formally arrested in the case on Monday (Apr 15),” Additional Superintendent Moniruzzaman of the Police Bureau of Investigation (PBI) in Feni told Bangla Tribune. Shampa was one of the four Burqa-clad people, whom Nursat named in her dying declaration for setting her on fire on Apr 6. PBI investigation also found she supplied the burqas to the perpetrators before the Apr 6 incident. “Shampa will be put on remand following a court order,” said Moniruzzaman. Police detained Shampa along with five others after the case was filed. Earlier on Monday, a Feni court also placed ex-Awami League leader Maksud Alam, a Sonagazi municipality councillor, on a five-day remand a day after he was arrested from Dhaka. Maksud, also a member of the governing body of Sonagazi Senior Fazil Madrasa, was suspended from the party on Friday. On Apr 6, Nusrat was set ablaze at an examination centre allegedly by people loyal to the madrasa’s principal Siraj-ud-Doula after he was arrested and subsequently suspended as she had accused him of sexually harassing her. Nusrat Jahan lost her battle for life on Apr 10 at Dhaka Medical College Hospital. On Sunday (Apr 14), two of the key accused - Nur Uddin and Shahadat Hossain Shamim - gave confessional statements before a court implicating 12 others in the crime including Sonagazi upazila unit's Awami League President Ruhul Amin. Nur Uddin and Shamim are the second and fourth named suspects in Nusrat murder case. They are Chhatra League leaders at Feni’s Sonagazi Islamia Fazil Degree Madrasa, where Nusrat was allegedly molested by Md Sirajuddaula. 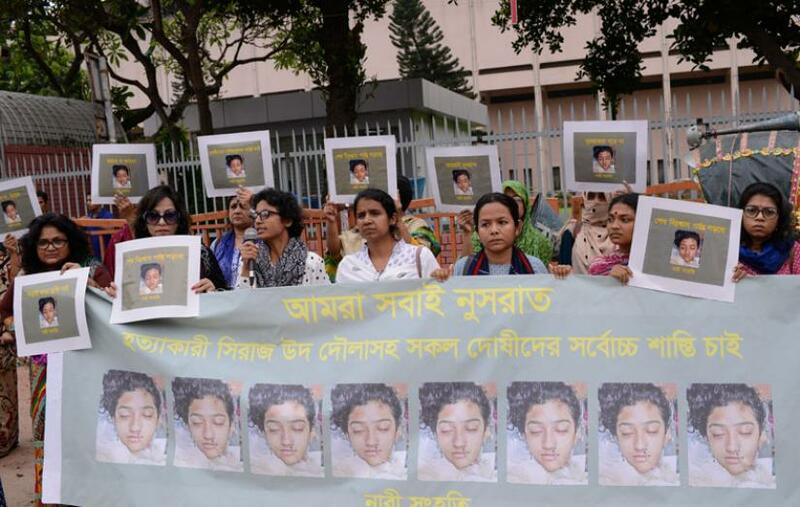 Investigation has found Nur Uddin met Siraj in jail to receive instructions for Nusrat's murder, while Shamim, whose advances the victim had refused several times, took part in the killing himself. PBI arrested both of them from Mymensingh on Apr 12.